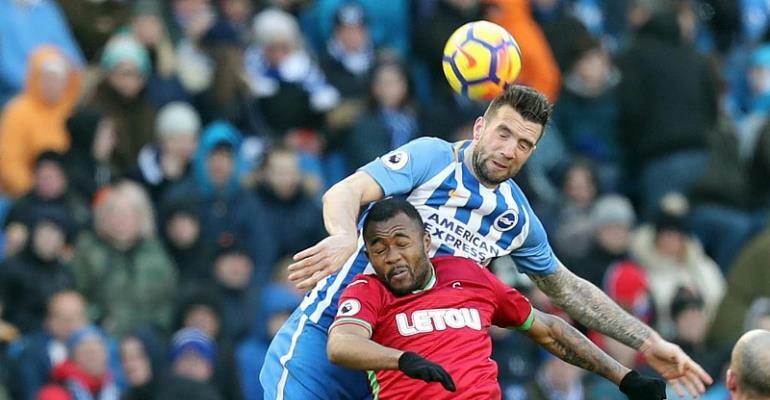 Jordan and his senior brother Andre Ayew played together for the second time at Swansea City but they were unable to inspire the Swans who were battered 4-1 by Brighton & Hove Albion on Saturday afternoon. Jordan lasted the entire duration but was unable to add to his seven goals this season. Andre, on the other hand, played 54 minutes after replacing injured Nathan Dyer in the first half. Glenn Murray netted a brace as a goal each from Knockaert and Locadia gave the host a comfortable four-goal lead before Tammy Abraham scored the consolation for Swansea. The defeat means the current squad have missed out on equalling a club record-equalling fourth Premier League away game without a loss.